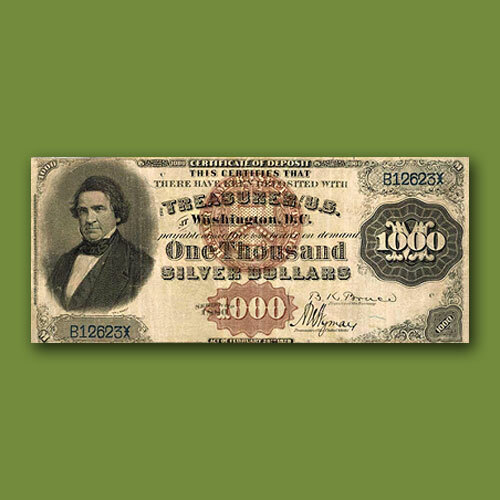 An 1880 $1000 Silver Certificate of Deposit from Joel R. Anderson collection, graded PCGS Currency Very Fine 25, was sold for $1,020,000, against an estimated value of $800,000 to $1,200,000 by Stacks and Bowers. Only two notes of this type exist in private hands. Designs are bold, the brown and blue overprints are strong and the paper is still bright and creamy white. There are small edge repairs on the back of the holder. It depicts a portrait of William Marcy, printed signatures of Bruce and Wyman, a big counter with 1000 overlapping Roman numeral M and Roman symbols inside the letters of CERTIFICATE. 8,000 such notes were printed and only five exist today. Three of them are a part of institutional collections. There are no notes of the Bruce-Gilfillan signature combination. An Amon Carter specimen of this type is recorded as Very Fine but was never publicly offered. It is possible to put together only two 1880 “Black Back” Silver Certificate type sets due to the note’s rarity. The same note was sold for $667,000 in October 2005.